My slow cooker has been working overtime the last few months. So much soup! I love it. Recently, we’ve been back to eating more meatless meals. 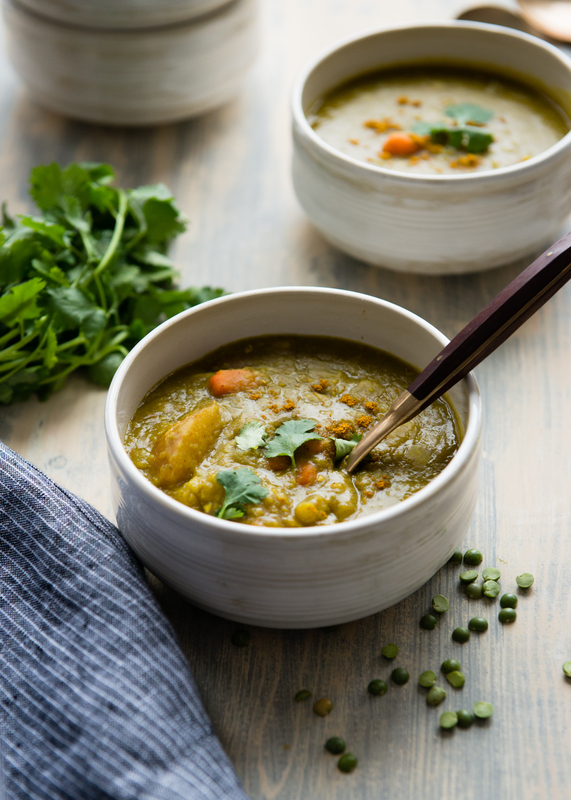 While most slow cooker recipes rely heavily on meat and poultry, this Slow Cooker Split Pea Soup is 100% vegetarian. In lieu of ham to flavor the soup, I’ve added a good dose of curry powder. I was an adult before I truly fell in love with split pea soup. It’s filling and comforting in a way that other soups are not. The thick, porridge texture gives it that stick-to-your-ribs feel. It’s perfect for a chilly day when all you want to do is stay inside, eat something warm and nourishing, and cuddle up with a blanket and book. I have about a dozen different kinds of curry powders and pastes in my kitchen. This recipe uses a good, basic Madras curry powder. Use the kind you like best, or if you’re not a curry fan, you can simply omit it or use dried herbs instead. 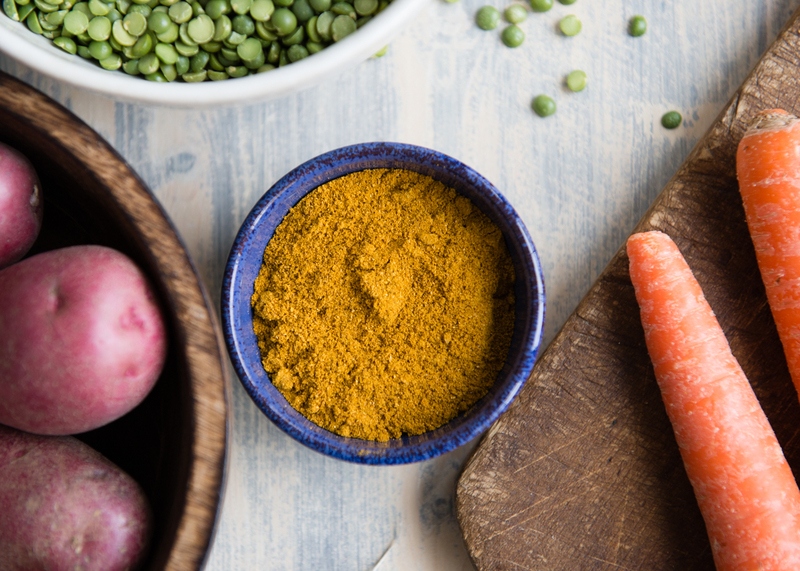 Curry powder gets its yellow color from one of our favorite spices, turmeric, which has anti-inflammatory properties. I feel like split peas are an unsung hero. 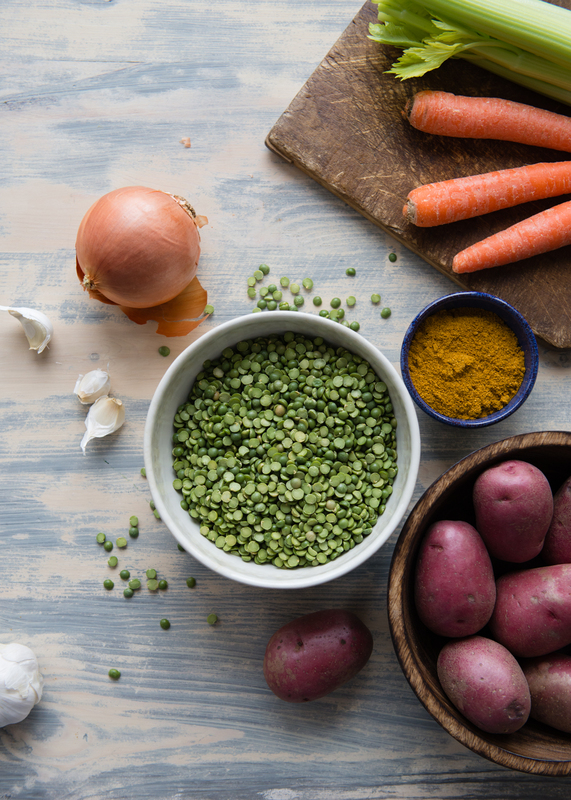 Often overlooked for other sexier pulses and legumes, split peas are low fat and loaded with dietary fiber. Just one cup provides 66% of the recommended dietary fiber for the day. And to that add in the trace minerals molybdenum, manganese, copper, phosphorus, and vitamins (folate, pantothenic acid, B1), and plant-based protein. This soup also has onion, carrots, celery, garlic, and red potatoes. I leave the veggies in larger pieces for a chunkier soup, but this soup is also great pureed. Be sure to check the recipe notes about the thickness of the soup. 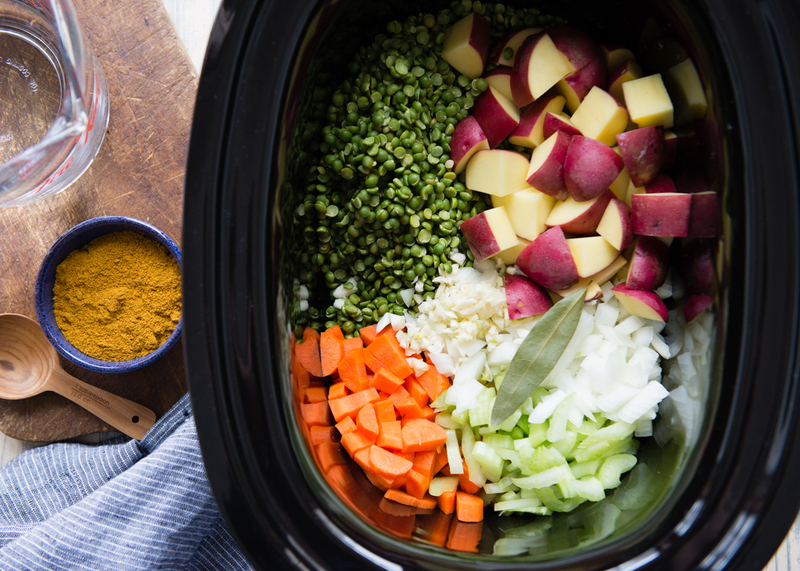 This super easy slow cooker split pea soup is as comforting as it is delicious. With a hint of curry and loaded with veggies, it's a healthy meal you can feel good about eating. Cook on HIGH for 4 hours or LOW for 8-10 hours. Remove lid and stir well. Taste and add salt and pepper. Remove bay leaf. 8 cups of water yields a moderately thick soup. Add an extra cup of water for a thinner soup. Keep in mind that the soup will continue to thicken after cooking. If it's too thick, add a little more water or broth.Can substitute 2-3 teaspoons poultry seasoning (thyme, sage, rosemary) for the curry powder. 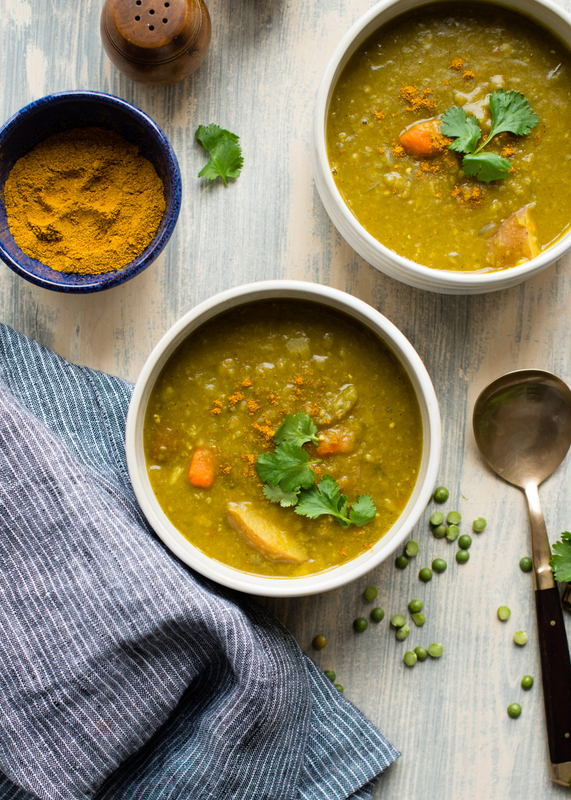 For a vegetarian smoky split pea soup, add 1 teaspoon liquid smoke and omit curry powder.